Learn more about our expert faculty members, who have worked with the FBI, NYPD, FEMA, and private security firms. With no GRE, GMAT, or application fee required, the online MHS is accessible for a wide range of prospective students. View our admission policies to learn more. 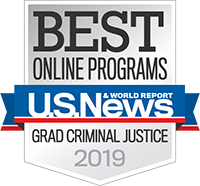 Our curriculum aligns with the Center for Homeland Defense and Security (CHDS) official master’s course catalog, a distinction that homeland security employers recognize. With the unfortunate rise of terrorist attacks around the globe coupled with unforeseen natural and manmade disasters, skilled homeland security professionals are in high demand. Offered by the Pace University Dyson College of Arts and Sciences, the online MA in Homeland Security prepares students to effectively respond to and recover from natural and man-made disasters and mitigate the impact of terrorist attacks. By combining essential leadership and management skills with in-depth knowledge of homeland security strategies, the program equips students with the tools required to help keep the nation safe. Leadership is important in all situations. But equally, if not more important, are managers who know how to use their expertise and use transferable skills to address any situation. As a participant in the Center for Homeland Defense and Security (CHDS) University Agency and Partnership Initiative (UAPI), the online MA in Homeland Security curriculum offers a number of courses from the official CHDS master’s course catalog as well as two specialized courses unique to the MHS. In addition, students have access to the CHDS Homeland Security Digital Library and all other resources. The professors at Pace really allow you to develop yourself, and the more I can keep myself apprised of what’s happening, the more I can keep us safer. The online MHS has assembled a diverse group of faculty members with a wide range of real-world experience in the field of homeland security. Whether they worked for the Federal Bureau of Investigation (FBI); Federal Emergency Management Agency (FEMA); or state and local police, fire, emergency management and public health organizations, each of them brings a unique skillset to the program to help students succeed. To learn more about Pace University's online MA in Homeland Security, fill out the fields below to download a free brochure. You can also call us toll-free at (866) 853-4658 to talk with one of our admission advisors.